Over the last few months, I’ve been reading up on the legal architecture of inter-municipal metropolitan segregation; that is, how it came to be that certain suburbs (and school districts) welcomed only the white and middle-class or wealthy, and others were home to everyone but. Up until this point, my study materials were mostly along the lines of Ta-Nehisi Coates’ 20th century urban reading list: redlining, contract selling, the Great Migrations, the anti-black riots and more diffuse violence; and, going back a bit further, Reconstruction and slavery. (Part of the thrill of reading his reparations piece was seeing books and essays I had read or read about so brilliantly weaponized.) And all of those things remain, of course, indispensable to the geography of inequality and, more broadly, American systematic deprivation writ large. But it’s become clear that something is missing from this narrative. (On second reading, this sentence is ridiculous: a million things are missing from this narrative. I claim only to present one that seems, at the moment, particularly important.) Specifically, the story of one of the major fronts of resistance to segregation that opened up towards the tail end of the 1960s, was largely defeated by the forces of white supremacy and economic privilege in the 1970s, and has remained on a slow, flickering burn since then. The issue is that even after “separate but equal” was struck down in Brown v. Board of Education, and after redlining, anti-black violence, and other forms of housing discrimination were made more difficult as a result of the Civil Rights Movement, a critical majority of white people decided that they were simply not up to dealing with the implicit and explicit promises the federal government had made about what day-to-day life would look like soon. Unfortunately for them, the most crucial tools of the previous three-quarters of a century of urban apartheid had just been kneecapped, if not completely done away with. So they set about codifying some new ones. First, they needed to build some walls. Conveniently, those already existed in the form of boundaries between municipalities, school districts, and other local government units. When courts ordered a public housing agency or school district to desegregate, the power of that order ended at the limit of the housing agency’s or school district’s jurisdiction; moving to the other side of those lines effectively invalidated the desegregation decree. The people fighting to make good on the government’s promises understood this. In 1971, a federal judge named Stephen Roth presided over Milliken v. Bradley, a suit brought by black families in Detroit, and reasoned that since all of metropolitan Detroit had been involved in segregation – participating in racist redlining practices and restrictive covenants, tolerating or encouraging violence – all of metropolitan Detroit ought to be involved in desegregation. Milliken v. Bradley ordered racial integration across school district lines, breaking down one of the most important legal barriers remaining between whites and blacks. And three years later, the Supreme Court built it back up. In a 5-4 decision, the 1974 edition of Milliken v. Bradley argued, incredibly, that they could find no evidence that Detroit suburbs or the state of Michigan bore any responsibility for the fact of all-white suburbs and all-black city schools, and that as a result any desegregation orders had to be limited to the city of Detroit. Can you guess where Detroit’s city limits are? But to function as intended, the wall needed a gate: one that would allow the right people through, and keep the wrong people out. The 1968 Fair Housing Act, passed months earlier in the tumultuous aftermath of the Rev. Martin Luther King Jr.’s assassination, directed the government to “affirmatively further” fair housing. Romney believed those words gave him the authority to pressure predominantly white communities to build more affordable housing and end discriminatory zoning practices. Romney ordered HUD officials to reject applications for water, sewer and highway projects from cities and states where local policies fostered segregated housing. Unfortunately, white suburban voters constituted most of Nixon’s political base, and he quashed Romney’s plan as soon as he found out about it. Concurrently, though, civil rights advocates were taking to the courts. The definitive case at the federal level was Arlington Heights v. Metropolitan Housing Corp., in which a Chicago suburb’s single-family-only zone was challenged on the grounds that it forbid more affordable housing, which had the effect of promoting racial segregation. Once again, a district court agreed with the plaintiffs, and it appeared that a major defense of segregation would fall; once again, the Supreme Court reversed the district court’s opinion and upheld the law. Once again, the Supreme Court failed to find compelling evidence that a law which it acknowledged promoted segregation might have been adopted for discriminatory reasons – despite the fact that Arlington Heights contained, at the time, only 27 black people and roughly 64,000 white people, or that it was located in one of the most famously segregated and racially violent metropolitan areas in the country. The battle continued at the state level – most notably in the Mount Laurel cases, in which the low-density zoning of a Philadelphia suburb was found to violate the New Jersey state constitution – but with otherwise mixed results. I will try to get into that later. [S]ome local governments have used the zoning power delegated by state governments to indirectly control who may live within their boundaries. There has been a consistent pattern of exclusionary zoning and land use decisions that have been barriers to the building of affordable housing in predominantly White neighborhoods in local jurisdictions with a predictable segregative and discriminatory impact on minorities. Similarly, low-density-only zoning has been common, despite its tendency to reduce the rental housing available and thus effectively excluding African Americans and Latinos from living in certain neighborhoods or even entire communities. The major impasse between the county and feds is over the settlement’s requirement that Westchester analyze local zoning to determine if it keeps out low-income, black and Hispanic residents…. The Town of Mamaroneck has already been taken off the exclusionary list after rezoning parts of the town to allow multifamily housing. 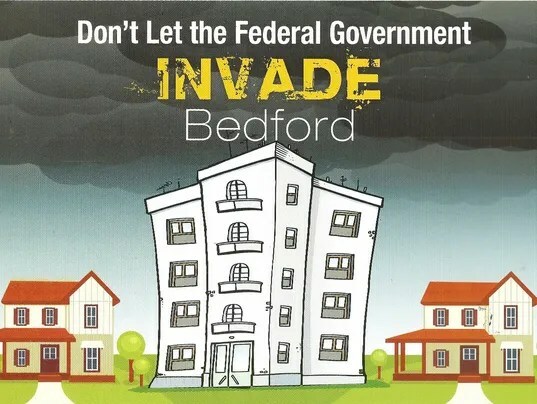 This anti-multifamily housing poster from Westchester is apparently unconcerned about the ways the word “invasion” has historically been used by white suburbanites. Neither Milliken nor Arlington Heights is likely to be overturned anytime soon, and the Obama Administration’s efforts notwithstanding, exclusionary zoning that protects legally-walled-off municipalities and their affluent residents is under no real threat. But it ought to be. One place that threat might plausibly begin is among urbanists, who fancy themselves re-engineers of suburban and urban social and economic geography. It might also be a route to making connections between the placemakers and street redesigners, on the one hand, and the community organizers and affordable housing activists on the other. One can hope. PS – It is obviously the case that the mechanics and location of exclusionary zoning have become somewhat more complicated since George Romney got slapped down by Richard Nixon: while suburbs remain the major sites of artificially unaffordable housing in most metropolitan areas, many central cities now qualify as well. (Though even in central cities – even in a place like Chicago – single family housing zones dominate.) The dynamics obviously differ in some ways, though they’re at root the same: places where demand for housing exceeds supply, and therefore prices are above the normal market rate. In any case, I wanted to note that complication here, and bookmark it for later investigation. Next Next post: Where does Chicago’s black middle class live? It’s worth noting that a larger number of single family home zoned districts (particularly some South and West suburbs) have acquired a large low-income and/or minority population. Even Englewood and West Englewood are largely zoned for single family homes. Why have these areas desegregated (and often resegregated) while Arlington Heights has similar demographics today as it had in the 1970s? To answer your question more directly, I don’t think zoning has an enormous effect on the broad outlines of where white/black/Hispanic/Asian/rich/poor/etc. people settle to begin with; the South Side didn’t become the “Black Belt” because of zoning, but because of racist FHA policies and anti-black violence. What is clear, though, is that zoning is extremely effective at keeping lower-income people out of existing well-to-do neighborhoods, for all the reasons listed above. Wow that poster is racist. Again, enjoying your posts. I read Coates’ article and appreciate the added context. Thanks! A couple of historical notes. It’s too simple to say that Nixon stopped Romney’s initiatives. There is reason to think that the Nixon administration promoted the dispersal of public housing into white suburbs with the deliberate intention of stirring up a white backlash that would benefit Republicans. Also, there’s a substantial literature on the discriminatory effects of zoning written in the late 1960s and 1970s. I have a bunch of references in Dead End, where I discuss this whole story and try to untangle the conflicting strands of class and race. Huh, that’s an interesting take I haven’t seen. To what extent, though, was public housing dispersed? Certainly the fear of it seemed (and seems) to surpass the actual likelihood of it happening to any given white middle-class suburbanite (or, for that matter, urbanite) by miles and miles. I don’t know if you’ll remember, but I was actually at one of your events in Chicago (at City Lit books), and got a copy of your book, so I will be reading about that shortly! Edit: Though I haven’t read all of it, I’ve seen enough to be able to recommend that anyone reading this check out Ross’ book. Ooh. Possibly exciting! There should be Westchester County lawsuits in every metropolitan area of the country. What is “normal market rate?” Did well in my college econ studies years ago and thought I had a fairly firm grasp of financial and economic fundamentals but I never encountered “normal market rate.” Sounds suspiciously like a terminology created to further subjective analysis.